Cyclooxygenase-2 (COX-2) is expressed early in colon carcinogenesis and is known to play a crucial role in the progress of the disease. Here we show that the regulation of the expression of this enzyme in a colon cancer cell line, and in patients, is associated with overexpression of the Wnt pathway-associated proteins, Pontin52/TIP49a and LEF-1. Recently shown to be essential for transformation via the c-Myc pathway, Pontin52/TIP49a promotes COX-2 expression in tissue culture and is overexpressed in colon cancer tissue, co-localizing with COX-2 expression in transformed tissue, relative to paired normal tissue. Both genetic and pharmacological studies have shown that the inducible isoform of cyclooxygenase, cyclooxygenase-2 (COX-2), is expressed early in colon carcinogenesis and plays a crucial role in the development of this disease . COX-2 expression is induced early in stromal cells and subsequently at high levels in epithelial cells, where it correlates with tumor invasion and clinical outcome . The regulatory pathway responsible for increased expression of COX-2 in colonic tumors is unknown. In multiple colon cancer cell lines, COX-2 expression appears to be constitutive. We have examined promoter sequences active in constitutive COX-2 expression and have shown that high basal activity is retained with a promoter containing only the COX-2 TATA box region . A normal function of the tumor suppressor and cell cycle regulator p53 is to negatively regulate COX-2 promoter activity by binding the TATA binding protein in this region . However, certain colon cancer cell lines that express wildtype p53 also display high levels of COX-2 mRNA. This suggests that other proteins may be important for regulating COX-2 expression. We have focused on the LoVo colon cancer cell line, as normal COX-2 5'flanking sequences (-1840 to -50 bp) had a 3-fold positive effect on transcription of a luciferase reporter construct in this cell line, though not in three other colon cancer cell lines tested, Colo320HSR, HCA7, LS174T (data not shown). COX-2 is known to be a downstream target of the Wnt signaling pathway. The Wnt pathway is highly conserved evolutionarily and has been implicated in many biological processes. Deregulation of this pathway results in the inappropriate expression of target genes and has been rigorously linked to carcinogenesis [5, 6]. Signaling through the Wnt pathway increases expression of COX-2 mRNA, COX-2 protein, and PGE2 levels . Therefore, candidates for proteins responsible for maintaining constitutive COX-2 promoter activity in carcinogenesis include effectors of Wnt signaling. One such protein, Pontin52/TIP49a, was isolated in an in vitro assay designed to identify protein binding partners in human colon cancer cells, using the N-terminus of the Wnt signaling molecule, β-catenin, as bait . Pontin52/TIP49a is also known to bind the TATA binding protein and the oncogenic protein c-myc [8–10]. Further, Pontin52/TIP49a has been implicated as a key factor in myc-dependent transformation . In addition to DNA binding, transcription factors function to recruit other proteins that modulate transcription and/or alter chromatin structure. In human and animal cancers, the Myc family of transcription factors is frequently disrupted [11, 12]. The N-terminal portion of c-Myc includes a conserved DNA region, the Myc homology box II (MBII), that is essential for apoptotic and oncogenic activities, as well as for blocking differentiation and stimulating cell proliferation [13–17]. This region binds to the nuclear factors Pontin52/TIP49a and Reptin52/TIP49b, homologous proteins found in all eukaryotic organisms as components of multimeric complexes thought to function in chromatin remodeling and gene transcription [10, 18–24]. They manifest oppositely-oriented helicase activities [18, 25] and appear to play antagonistic roles . For example, in a zebrafish study of heart and gut development, the relative balance of Pontin/Reptin activities regulated the extent of cell growth during organogenesis in the early embryo . Pontin52/TIP49a and Reptin52/TIP49b form complexes with c-Myc in vivo and this association depends on the N-terminal c-Myc domain that is essential for oncogenic activity [10, 28]. A missense mutation in the Pontin52/TIP49a ATPase motif inhibits the oncogenic activity of c-Myc, but does not inhibit normal cell growth, indicating that functional Pontin52/TIP49a protein is an essential mediator of c-Myc oncogenic transformation . The Pontin52/TIP49a protein has also been shown to be a key modulator of apoptotic activity for both c-Myc and E2F1 . The fact that Pontin52/TIP49a can also bind to β-catenin and LEF-1/TCF  supports a role for Pontin52/TIP49a as a cofactor likely to function with diverse transcription factors. To evaluate the role of Pontin52/TIP49a in the transcriptional regulation of COX-2, we transfected a reporter construct containing 1840 bp of upstream COX-2 sequence into the LoVo colon cancer cell line along with a control vector or increasing amounts of a Pontin52/TIP49a expression construct. A dose-dependent increase in COX-2 promoter activity was observed when increasing amounts of Pontin52/TIP49a were co-transfected with the COX-2 construct (Fig. 1A). 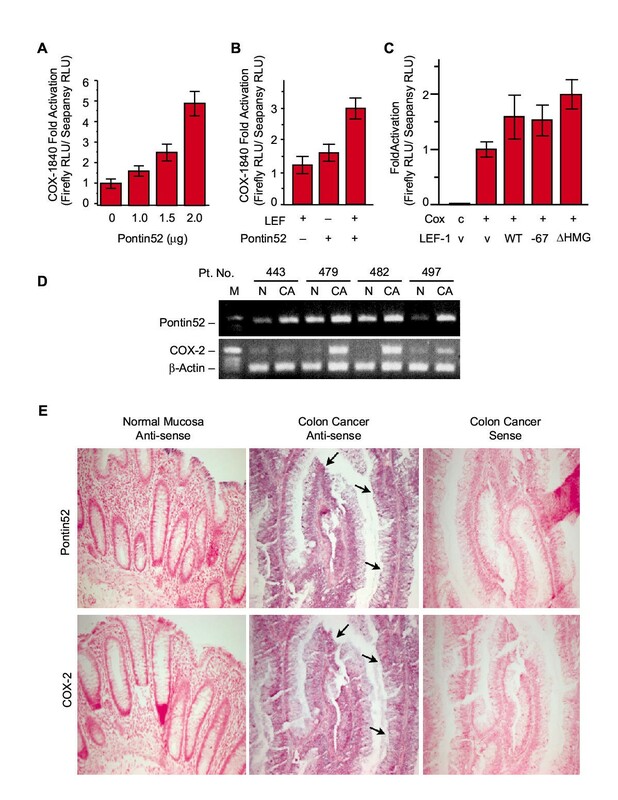 COX-2 expression is increased by Pontin52/TIP49a and LEF-1 over-expression; colon cancer tissue shows increased expression and co-localization of Pontin52/TIP49a and COX-2. (A) Pontin52/TIP49a overexpression increases COX-2 promoter activity. Increasing amounts of an expression construct for Pontin52/TIP49a were transiently transfected into LoVo cells along with a COX-1840 reporter construct. A dose-dependent increase in COX-2 promoter activity was observed in co-transfections with Pontin52/TIP49a. (B) The COX-2 promoter is activated in an additive manner by co-overexpression of LEF-1 and Pontin52/TIP49a. cDNAs for LEF-1 (0.5 μg) and Pontin52/TIP49a (1 μg) were transfected into LoVo cells alone or in combination. Data are the means of assays performed in triplicate in each of two independent experiments. RLU: relative light units. (C) LEF-1 activation of the COX-2 promoter is independent of the β-catenin binding region (Δ N67) or the DNA-binding HMG domain (HMG; amino acids 300–359) of LEF-1. Transient transfection of LoVo cells with the -1840nt COX-2 reporter construct (+) and constructs containing wild type LEF-1 (WT) or the indicated constructs were completed. Controls included a COX-2 promoterless reporter, pGL3-basic (c) and LEF-1 vector controls, FLAG or EV3S (v). Data are the means of assays performed in triplicate in each of 3 independent experiments. In the LEF-1 transfected cells the fold-increase ranged from 1.2 to 2.3 and the average is shown. This response was observed in multiple other experiments, using different amounts of transfected cDNA, and in different cells. (D) Reverse transcription PCR was performed with cDNAs from paired samples of normal (N) colonic tissue and colon cancer tissue (CA) from each of four patients. The top panel shows Pontin52/TIP49a expression; the bottom panel shows COX-2 expression (upper band) relative to a control template (β-actin, lower band). The data shown are representative of two experiments. (E) An example of in situ hybridization using anti-sense (experimental) and sense (control) probes for Pontin52/TIP49a and COX-2, showing co-expression and up-regulation of mRNAs for both proteins in a colon cancer sample, compared to normal mucosa from the same patient. The TCF/LEF transcription factors are downstream components of the Wnt signaling cascade . In general, DNA binding alone is not sufficient for TCF proteins to activate transcription via this pathway. First, TCFs must form a complex with β-catenin  in which TCF provides a DNA binding function and β-catenin a transcriptional activation domain . Because COX-2 is a known Wnt target , we examined whether overexpression of the Wnt pathway protein LEF-1 affected COX-2 promoter activity. In Fig. 1B, we show that overexpression of either LEF-1 or Pontin52/TIP49a modestly increased COX-2 promoter activity in the LoVo colon cancer cell line. Overexpression of both proteins had an additive effect on COX-2 promoter activity. Of interest, LEF-1 activation of the COX-2 promoter did not require LEF-1 binding sites for either β-catenin or DNA (Fig. 1C); thus, this activation of COX-2 expression appears to occur through a novel mechanism. Previous reports suggest that certain Wnt signaling pathways are independent of β-catenin [32, 33]. To evaluate the expression of Pontin52/TIP49a and COX-2 in normal mucosa and colon carcinoma tissues, tissue samples from seven patients were analyzed by RT-PCR (Fig. 1D). An increase in the level of Pontin52/TIP49a mRNA was observed in four of the colon carcinoma samples, but in none of the samples of normal mucosa. Similarly, in three patients an increase in the level of COX-2 mRNA was observed in carcinoma, but not in normal colonic tissue. In situ hybridization showed that Pontin52/TIP49a and COX-2 were co-localized in tissue sections from individuals previously shown to have up-regulated levels of both proteins (Fig. 1E). Strong mRNA hybridization was detected throughout dysplastic epithelium for both Pontin52/TIP49a and COX-2. In contrast, only low to undetectable levels of hybridization were observed in normal mucosa with either probe. Thus, these proteins are both overexpressed and co-localize in colon carcinoma, a pattern that is compatible with Pontin52/TIP49a participating in COX-2 expression during carcinogenesis. Previous work showing that Pontin52/TIP49a modulates c-myc-dependent apoptosis  may be related to our finding that Pontin52/TIP49a induces COX-2 expression. Multiple observations support the conclusion that COX-2 expression during carcinogenesis blocks apoptosis in response to some stimuli. Thus, the demonstration by Dugan et al. (2002) that showed a dominant negative construct of Pontin52/TIP49a caused increased apoptosis might have reflected decreased expression of COX-2. We show here a trend toward upregulation of Pontin52/TIP49a and COX-2 expression in a coordinated fashion. In one patient, Pontin52/TIP49a mRNA was increased, but COX-2 mRNA expression levels were comparable in colon cancer tissue and normal mucosa. Thus, our results are consistent with a scenario where Pontin52/TIP49a dysregulation occurs prior to COX-2 overexpression in carcinogenesis. Colon cancer cell lines Colo320HSR, LS174T, and LoVo (American Type Culture Collection) were grown in RPMI-1640, MEM, and either Hams F12 or DMEM media, respectively (Life Technologies, Gibco). HCA7 cells, provided by Dr. Susan Kirkland (ICRF Histopathology Unit, London, UK) were grown in high glucose DMEM with 110 mg/l sodium pyruvate. Ten percent fetal bovine serum and 100 units/ml each of penicillin and streptomycin were used throughout. Cells were grown to 60–85% confluency before transfection or RNA isolation. For transfections, LipofectAMINE PLUS (Gibco) was used according to manufacturer's suggestions. After a 3-hour transfection, 0.5 ml of 10% FBS/DMEM media was added and the plates incubated 24–48 hours. Plates were harvested, cellular debris was pelleted, and 50 μl dual (firefly and sea pansy) luciferase assay reagents (Promega) were added to 50 μl supernatant aliquots and measured in a luminometer (Dynex Technologies Inc.). For some experiments, firefly luciferase activity was normalized to total protein concentration (BCA protein assay, Pierce). Experimental constructs containing firefly reporter DNA were normalized to empty vector sea pansy luciferase controls. The expression constructs were provided by Dr. Marian Waterman (Burnham Institute, La Jolla, CA), LEF-1 cDNA (EV3S vector); Dr. Donald Ayer (Huntsman Cancer Institute), FLAG-tagged N-terminally deleted LEF-1 constructs; Dr. Rolf Kemler (Max Plank Institute of Immunobiology, Freiburg, Germany) , Pontin52/TIP49a cDNA (CS2+ vector). A CMV-sea pansy luciferase control plasmid (pGL3-basic), LEF-1 deleted for the DNA-binding HMG domain (amino acids 300–359) (EV3S vector), and Pontin52/TIP49 (pCDNA3 vector) were constructed using standard techniques. Sequences were analyzed by automated sequencing. Total RNA isolated by the Trizol procedure from either colon cancer or normal mucosa tissues was reverse transcribed using 1 unit/μg Moloney Murine Leukemia Virus polymerase (Gibco). Reactions were primed with 5 mM oligo (dT)12–18 in the presence of 10 mM DTT, 0.5 mM dNTP, and 0.4 units of RNAse Inhibitor (Promega). Template cDNA was amplified by PCR (conditions available on request). Human tissues were supplied by the Tissue Access and Imaging Core Facility at Huntsman Cancer Institute. RNA probes were made by incorporation of biotin-UTP using an in vitro DIG RNA labeling kit (Boehringer Mannheim). The probes utilized were: Pontin52/TIP49a antisense, 1 kb; sense, 698 bp; COX-2, antisense and sense 413 bp. Paraffin embedded tissue of colonic carcinoma and grossly uninvolved colonic mucosa were prepared and analyzed as described previously . MLC conceived, planned, and completed the experiments described. ETW evaluated the literature and prepared the manuscript. SMP participated in study design and evaluation. All authors read and approved the final manuscript. We thank Kelley Murphy for performing the in situ hybridization experiments and Kavita Dave for technical assistance. We are grateful to Drs. Cindy Cao, Terrece Pearman, Debbie Regier, Diana Stafforini for helpful discussions and review of the manuscript and to Diana Lim for the preparation of the figures. This work was supported by grants from the National Cancer Institute (P30 CA42014) and the National Institutes of Health (PO1-CA73992).